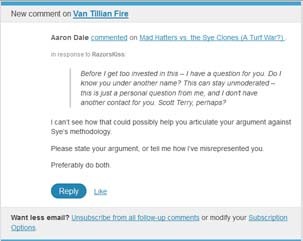 The author, Aaron Dale, at the blog “Van Tillian Fire,” has written a critique of my much-critiqued “Dear Sye” post. For reasons unbeknownst to me, he neglected to read the post of the following day, “The Shattered Stained Glass Window”, as well as the post “A Necessary Distinction.” Why is this important, you ask? It is important because these were written several months ago – and written specifically to provide specifics about issues I left unstated, or merely referred to in general terms in the initial post. Why did I leave them unstated? I left them unstated because the recipient of the post knew exactly to what I was referring, when I called him to repent. It was not necessary to list what I was calling him to repent of – he was quite aware of what that was. I also left them unstated because our regular readers also knew exactly to what I was referring, insofar as methodology is concerned. The third reason I left those issues unstated was as a sort of shibboleth. Those who read this site regularly knew exactly what I was referring to when I referred to methodological issues. Those who didn’t, wouldn’t. I intended, regardless, to write that second post. There was a reason it went up the following day, after all. To my knowledge, there has been not a single critique of that post. Nobody has even attempted to respond to it. Strangely, that is the post that has the argument I am making against Sye’s methodology, in specific terms. Those who have listened to Sye’s presentations know that I accurately represented his methodology. That is indisputable. Oddly, however, nobody has disputed my critique of that methodology, either. To a man, every single critique has been of a challenge directly to Sye, by name, which refrained from dragging any dirty laundry into the public eye. Why? They were things I don’t believe should be aired publicly, needlessly. They are failings that have to do with Titus 1:7-9 – failings specific to the teacher. If you review the post, the context is quite clear. Read the last paragraph. I am not, as I have repeatedly clarified, speaking of whether he is accountable to elders in some respect. I am questioning whether his accountability extends to what he actually does and says – specifically online, as well as in certain public venues where he has engaged in exceedingly unwise behavior. Sye is aware of the specifics for which I called him to repent – and I still hope that he will do so, despite his silence on the issue until this day. These issues, however, are what the first post concentrated on. They referred to his methodological issues in a general sense – and as a symptom of what I believe to be a lack of preparation and study on his part. It is both those symptoms, and the underlying cause for those symptoms, that I addressed in the two posts to follow. Again, if my critique of his method – which is what everyone seems to be concerned with – is the issue, why has no one responded to the posts that were specifically on that topic? Instead, each and every critique of my critique of Sye has dealt solely with the post that doesn’t deal with that topic specifically, and ignored completely the posts which have? When I pointed this out to Mike, in A Necessary Distinction, he at once saw the points that I had made, and acknowledged their legitimacy. So, with that introduction out of the way, why am I writing this? I am writing this because someone else – Aaron – has decided to critique the “Dear Sye” post acontextually. Not only that, but he has thus far acted most oddly when I responded to his critique. As far as I can tell, Aaron is not especially familiar with what I have written previous on this, or any other topic. As such, he is a prime candidate for the “shibboleths” in the initial post to Sye. I have found that using such things helps to give me an idea of where someone is coming from, when they respond. Aaron is a Presbyterian, a WCF subscriber, and is an undergraduate philosophy student, according to his bio. By the title of his post, he is either using Chris’ quotation of Dr. White’s comments concerning the “Sye affair”, or he is quoting Dr. White himself. Given the timing on the post, I suspect the former. Of course, I have my own opinion on Dr. White’s comments in that vein. When he made his comments on the Dividing Line, I recognize that Dr. White is a very busy fellow – and I believe that his comments on the situation were made without actually reading the second post I put up. Further, I have said before that Dr. White and I don’t agree on some methodological aspects. I will nuance this, however, by saying that when we disagree, I am convinced that his practice shows that he does agree with me for the most part. His own work isn’t as highly concentrated on the specifics of the methodology as ours is, and his study is quite broad in comparison to that of any of the contributors here. We fill a very specific niche with what we do. As such, I would, hesitantly, but with respect, posit that there are certain things within our specialty that he hasn’t studied as thoroughly in some respects. Again, anyone who has read what I write knows that I think the world of Dr. White. His comments about my disagreement with Sye, however, were inaccurate. I told him so, too. Enough of that, though. Aaron’s site has been up for a little less than a month. I am not aware of seeing Aaron around before this. The central issue regarding Sye’s apologetic, first off, is that it isn’t what the Bible teaches, what Van Til taught, and not even what Bahnsen taught. It is a narrow, one-issue methodology focusing almost entirely on epistemology, and even within that, engaging in a vain repetition that by itself is needlessly offensive. There isn’t anything wrong with discussing that topic. There is everything wrong with rarely discussing anything else, and further, giving the impression that you cannot. While it is true that epistemology connects with everything else, eventually, so does every other Christian doctrine connect with every other Christian doctrine, in the same fashion. The Christian epistemology is one doctrine of a system. It is important, of course, to recognize that interconnectedness, but can you explain why, specifically, epistemology is interconnected to every other doctrine, and to every fact in creation, at some level? Further, is it not true that the ontology (or existence) of epistemology itself presupposes the truth of Christianity? That’s not an epistemological transcendental, it is an ontological transcendental. There is a dangerous imbalance in making every apologetic encounter revolve around a single subject. Apologetics is the flip side of the evangelistic coin. If the evangel is not all about epistemology, then the apologetic should likewise not be. Or, let’s put it another way. What is the faith? Well, according to my confession, it is “The whole counsel of God concerning all things necessary for his own glory, man’s salvation, faith and life, is either expressly set down or necessarily contained in the Holy Scripture.” Well, let’s ask ourselves – can we defend the whole counsel of God solely on the basis of epistemological argument? No, we cannot – and should not. Can we do so by using the full range of transcendental argumentation? We most certainly can. I mean reducing apologetic argumentation to only that they can’t know anything apart from God. Here’s another example. Man’s existence presupposes the truth of Christianity. Man exists. Therefore Christianity is true. Notice, also, one significant difference in what I am saying. Notice that I am consistently saying that “Christianity is true” is the presupposition we hold to. This can be said another way – the Triune God of Scripture exists. This is a two-fold presupposition – God exists, and He has spoken. What He has spoken is true, and we believe what He has spoken. The summation of all that God has said, and that we are to believe, is Christianity. You will often see it coded as “CT” in argumentation. For example: Man’s existence presupposes CT. Man exists. Therefore, CT. We are defending more than knowledge, although we don’t dispute that we defend that. We also defend the existence of man. We also defend the nature of man. We also defend the nature of God, of creation, of morality, of beauty. We defend all of what Scripture teaches. We should not take a tortuous route of doing so in order to keep to our comfortable, scripted argument concerning epistemology. You can always get there, eventually, but I think those who try would be hard-pressed to explain why it is the case that you can, eventually, always get to epistemology. I will give you a hint – it concerns a very significant attribute of God that figures very prominently in Reformed systematic, and about which I post very frequently. Even if you did know why – can you defend that via epistemology without an extremely tortuous argumentative path, that accomplishes quite the opposite of the intent, which is to “keep it simple”? I would submit to you that you cannot. The Christian faith is not all about epistemology, despite the truism that it all relates to epistemology in some sense. Human epistemology presupposes CT. Human epistemology, therefore CT. Once again, we see CT, as a whole, being the necessary precondition – even for what is the favorite subject of many! I am objecting on this basis: “It is a God-given duty that we should take the content of Scripture and bring it together in a systematic whole. It is plain that we are required to know the revelation that God has given us. Yet we would not adequately know that revelation if we knew it only in its several parts without bring those parts into relation to each other. It is only as a part of the whole of the revelation of God to us that each part of that revelation appears as it is really meant to appear.” (See this post) It does no lasting good to argue only on the basis of epistemology. We argue systematically, or not at all. I am objecting on this basis: “Van Til does clearly distinguish “positive statement” from “defense,” and though in general he aligns the first with theology and the second with apologetics, he does insist that, because each is indispensable to the other, theology must have an apologetic thrust, and apologetics must expound theology. The difference between the two in practice, then, becomes a difference in emphasis rather than of subject matter.” (See this post) We cannot simply stick to epistemology, and expect this to be sufficient! Apologetics must expound theology. All from the post that “Aaron Dale” couldn’t seem to manage to read. Shotgun would probably be quite surprised at how much of his material I have read over the years. I think he is utterly out of his mind, but I am quite familiar with his work. The difference between proper analysis and improper is 1) Knowledge and exposition of your own worldview as well as 2) Knowledge and exposition of your opponent’s. Sye’s problem is the lack of exposition of 1 in apologetic encounters. Scott’s is a fundamental dishonesty concerning his opponent’s. I also argue that his own position is incoherent, to boot. I honestly have no interest in bandying any more words with Scott on this issue – and I call him to repent of both his despicable scripture-destroying idea of separation, as well as his dishonesty concerning his treatment of my writing, and of his readers. Van Tillian Fire is the product of a Kinist named Scott Terry. Be warned. 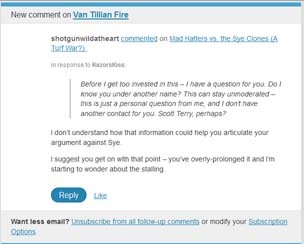 vantillianfire.wordpress.com is the product of “shotgunwildatheart” – aka Shotgun, the author at ShotgunBarrelStraight – Scott Terry, the Kinist. Hope that clears things up – or at least informs you.